It’s another Recipe Swap Friday, hosted by Sarah of A Taste of Home Cooking!! I had to sit out of the last round because, as you all have seen, my posting presence has been…lacking…lately and I just couldn’t commit. But life seems to have leveled out a bit…again..and I’m slowly working my way back up to mulitple posts in a week. It’s the little things, right? Ha! 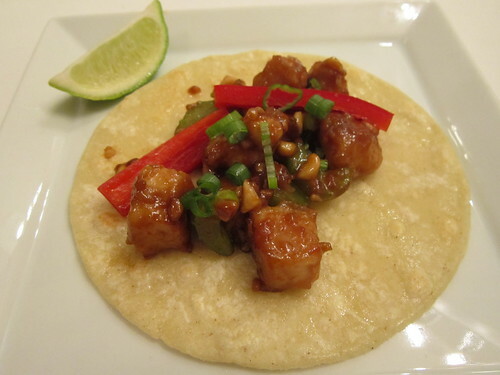 Add this to your Taco Tuesday must-makes, and check out the other great swap recipes below!! Place the chicken pieces in a large resealable plastic bag with 1 tablespoon of soy sauce. After the chicken is coated with soy sauce, add 1/4 cup of cornstarch to the ziplock and shake to coat the chicken well. Heat a large skillet over medium-high heat with 1 tablespoon of canola oil and add the chicken to the pan cook for 3 minutes on each side until cooked thoroughly, about 6-7 minutes total (this can be done in batches). Add the celery and peanuts during the last couple of minutes. Meanwhile, combine the remaining 1 1/2 teaspoons of cornstarch, 2 tablespoons of soy sauce, honey, sesame oil, rice vinegar, and sambal oelek in a microwave-safe bowl. Stir until smooth and microwave on high for 1 1/2 minutes until slightly thick, stirring twice. Remove from the microwave and stir in the garlic. Pour the sauce over the chicken, celery, and peanuts, and stir to coat all of the chicken. Cook the corn tortillas for a few minutes on each side on a griddle pan over medium-high heat or under a broiler until slightly blistered. To assemble, place a couple of spoonfuls of the chicken mixture into the center of each tortilla and top with green onions, red bell pepper, and a squeeze of lime juice. This is one of my absolute favorite recipes. It is so good. Poor J, for only getting a picture! I am glad you are “back,” I love your recipes! They are delicious aren't they? I almost added them to the menu after submitting them. Maybe next week. Yep, definitely adding these to the menu soon!